If your looking for a locksmith Broxburn engineer you have found the right company! Although I have been a locksmith for years now, I can remember my thoughts when I had to call a locksmith. From what I’d been told, I knew it wasn’t going to be cheap, that’s for sure! I can remember one friend telling me he called out a locksmith when he had locked himself out. He said the locksmith came out, drilled out the lock, and fitted a new one. The locksmith was there no longer than 15 minutes, and charged him £150! At the time I thought that sounded expensive, but now I’m in the trade I don’t think its expensive, I think its ridiculous! considering a locksmith can buy in a lock at trade prices, the customer has probably paid well over £100 for around 15 minutes work. At Alcatraz we think those types of locksmiths should hang their head in shame! They way we look at things at Alcatraz- Edinburgh locksmiths; you can rip a person off once, and get away with it. However, you will never receive custom from that person again. Nor will they recommended you to their friends and family. At Alcatraz locksmiths, we are in this game for the long haul. We never rip a customer off! We make our money through volume of work, which partly comes from repeat custom and word of mouth. What the ‘rip off’ locksmith doesn’t realise (or probably doesn’t care about), is customers can post negative reviews on-line. Google, the biggest search engine by far, is not stupid. It takes notice of these negative reviews, and will eventually downgrade the offending persons website position. So the ‘rip off’ locksmith may make good money in the short term, but karma will definitely catch up with them in the long term! If you wish to enquire about our prices feel free to call us any time. 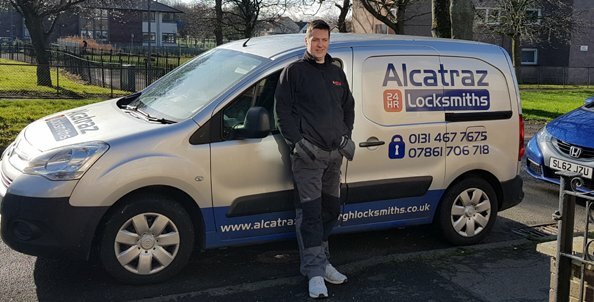 We are confident you will not find a better priced locksmith service in Edinburgh and the Lothian’s. However, if your trying to save money on calling out a locksmith, maybe you can fix your own problem? check out our common lock problems webpage. Many people do not realise their homes are secured with locks that are not that great. These locks may not meet the minimum security standards to validate their home insurance policy. Meaning if the house is broken into through a door secured with one of these locks, the insurance company will throw out the claim. Usually most insurance policies require a house to be secured with British standard locks. This means a wooden door will need a 5 lever British standard mortice lock, and a UPVC door would need a British standard euro lock. It is for good reason insurance companies require British standard locks on an insured property. Some thieves are not stupid (although most are!). They know what to look for when scouting a property. They know getting into a property secured with British standard locks is much harder than a property secured with standard locks. The above video shows just how easy some standard locks are opened by someone with a little knowledge. Although these locks very easy to pick open, the burglars preferred method of entry is to snap the lock whilst its still in the door. They will then poke out the lock, and open the door with a screwdriver. DON’T be caught out by a burglar, new locks are not as expensive as most people think!